In late 2006, Clear Channel Music posted the entire The Rising Tied album complete with commentaries from Mike Shinoda before each song. On "Feel Like Home", he said, "When I first did my verse to ‘Feel Like Home’, I remember taking it to Jay, uhm, and this was the typical thing that would happen with the executive producer role – I’d send him a song and he’d listen to it and give me some feedback. Like on this song, for example, he said, you know: “I really like the beat, I like the hook, uhm, but the verses in general, could be a little deeper.” The verses that we had on here before were kinda like these, but didn’t go into specifics, as much as these did, and so he said, you know: “You remember that movie ‘Friday Night Lights’, where, you know, everything was really heartfelt, and it was real serious and at the end of the story there wasn’t necessarily a happy ending for everybody.” That’s kind of, you know, the reality, the situation in these… with these stories. And I went back in and rewrote my verse to make it more specific. I added things like, you know, standing on the bridge, and my grandfather’s funeral, and just holding a cup of coffee in my hand. Those little details seemed to make a story, you know, jump out of me. Uh, and then when I played it for Jay, he said that, you know, that it was ready for the record." Features vocals by Styles Of Beyond. All digital releases of the clean album comes with an explicit version of the song. The physical release however, comes with the clean version. "Feel Like Home" got its live debut at the MySpace 2nd anniversary party, being played mid-set after "Believe Me". 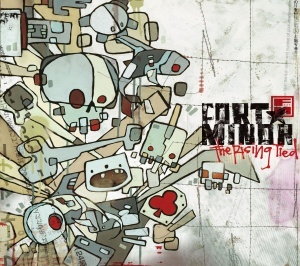 The song maintained that position until the first show of Fort Minor's US tour, where "Feel Like Home" was moved to follow "Where'd You Go", since "Believe Me" had moved down to close the main set. The song stayed in this position until Fort Minor went on hiatus. Though Fort Minor stopped playing "Feel Like Home" in April of 2006, Styles of Beyond continued to play the song up to July 10, 2006. Seeing him tonight's gonna be the last time. I'm just tryin' to make some sense in my mind. Get away from the grey, just a bit at a time. My life's like tryin' to swallow a pinecone. Smoke, drink, piss, sniffing everything in my sight. When you're so far left, that even death looks right. That it gets a little better than yesterday. Too many problems goin' on, that's why I left my girl. While lost souls search over and over again. Just pretend you don't feel so alone.